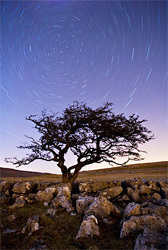 When I’m taking shots like this one at dusk on Twisleton Scar, near Ingleton, it often feels as I stand looking at the stars waiting for the exposure to finish, that the sheer huge timescale of the formation and ultimate erosion of the limestone pavement is somehow revealed. Even the gnarly old hawthorn trees seem like nothing more than fleeting visitors to the landscape, while the rotation of the cosmos above sets that in an even larger universal scale. It’s a reminder to me that all our landscapes are temporary and ever changing, even if they seem static within our brief visits. Watching the BBC’s Wonders of the Universe last night set this into an even greater context and it’s well worth a watch (see BBC iPlayer – Wonders of the Universe). It gave a great sense of the scale of time in the universe and how time itself is characterised by irreversible change.